It’s spring on my side of the world! And the season for yard sales is here. Or is steadily approaching at least. Spring cleaning and purging is underway, and the people in my neighborhood are readying their sidewalk signs and organizing potential sale items into bins and baskets (or so I imagine). I love yard and garage sales… the treasures that can be found amidst the random rubble of years gone by. I love random. And of course, I love a bargain. As well as the feeling of reusing and re-purposing… of giving away and letting go. What’s the coolest thing you’ve picked up from a yard sale? 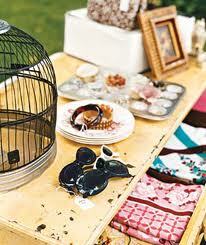 Laid out on the lawn on folding tables, all no-longer needed items are listed at a fair price. Cotton dresses with faded polka dots hang limply on hangers; the long sleeves of blouses long gone out of style wave in the breeze, sweeping through the neatly organized memories. the house, through the window, wondering who would possibly want a poster of David Bowie, a poster creased with folding lines. Solid-colored t-shirts flap like flags, calling to neighbors, dog walkers, anyone interested in place mats with a few unnoticeable stains.